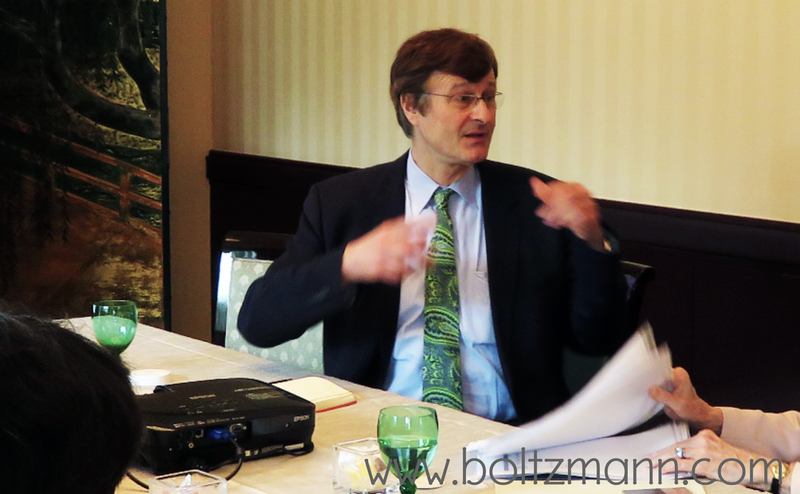 Gerhard Fasol: Ludwig Boltzmann Forum on Women’s development and leadership - workshop objective - Ludwig Boltzmann. Measure information. Board Director, GMO Cloud KK. and as an additional bonus we will create new cooperations and new initiatives. 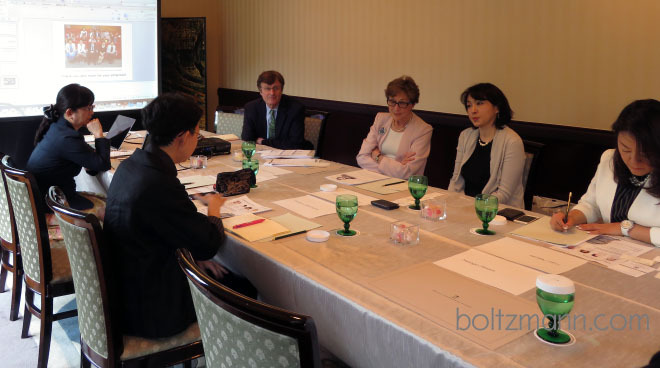 Several confidential preparations with Japanese Ministry officials and foreign Embassies in Japan. 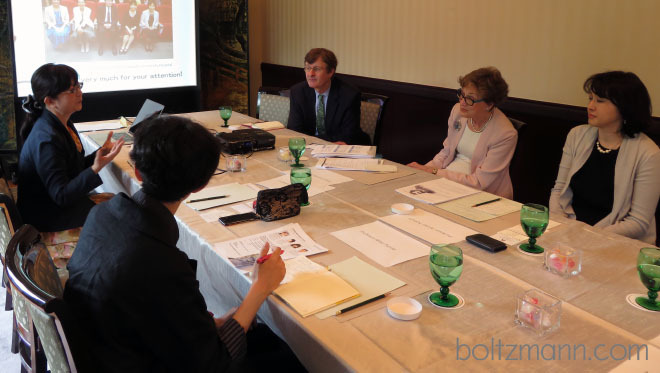 At the 8th Ludwig Boltzmann Forum on 18 February 2016 at the Embassy of Austria in Tokyo, honored by the participation of Her Imperial Highness, Princess Takamado, and Nobel Prize Winner Shuji Nakamura, invited Professor Kyoko Nomura to give the keynote “Gender inequality in Japan: a case report of women doctors“. 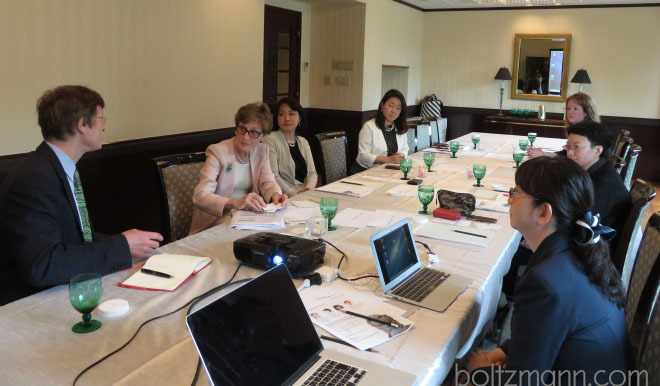 Next step is today’s (16 May 2016) “Ludwig Boltzmann Forum on Women’s development and leadership”. How to change mindsets? Expand the solution space and add new dimensions! The basic issues, empowering women and men to combine child care and professional development, work towards greater equality and improving decision making by implementing diversity of decision makers are similar all over the world, especially in Europe and Japan. Learning solutions from each other, expands the dimensionality of the solution space. When we are looking for solutions to solve difficult problems, our search for solutions is limited by our experience, knowledge and imagination. Our search for solutions is in space of limited dimensionality. In many cases solutions exist outside the space we are considering. Therefore to reach better solutions, its necessary to expand this solution space. Looking how other countries solve similar problems is one straight forward way to expand the dimensionality of the solution space, and that is where the Ludwig Boltzmann Forum aims to contribute. As an example, many people in Japan do not know that most European countries have a Family Ministry (家族省), which represents Families at the Cabinet level. In fact, most Japanese people I have been discussing this issue with are perplexed by the possibility of a Family Ministry (家族省), and usually in response ask, what the tasks of a Family Ministry would be. If your country does not have a Family Ministry, if you have never heard about a Family Ministry, its difficult to come up with the proposal to create a Family Ministry, and its difficult to imagine what a Family Ministry should do. And here is the current Austrian Minister for Family and Youth, Dr. Sophie Karmasin. 49 years old, with two children, Dr Sophie Karmasin has achieved a Doctorate in Psychology on “consumer behavior in the health market”, from 1993 to 2013, for 13 years she has pursued a very successful career in industry, most recently as Managing Director/CEO of a major market research company, before becoming party independent Minister of Family and Youth. She is not affiliated with any political party, but independent politician since 2013. Expanding the solution space: wouldn’t it be better to have at least one woman on a committee promoting women’s empowerment? Compare Family and Youth Minister Dr Sophie Karmasin with the almost all-male “woman act.” committee promoting women’s equality in Japan’s Kanagawa Prefecture, wouldn’t it be better to have more women on the committee promoting women in leadership? But unless you are familiar on how this is done in other countries, your solution space is limited to what you know. 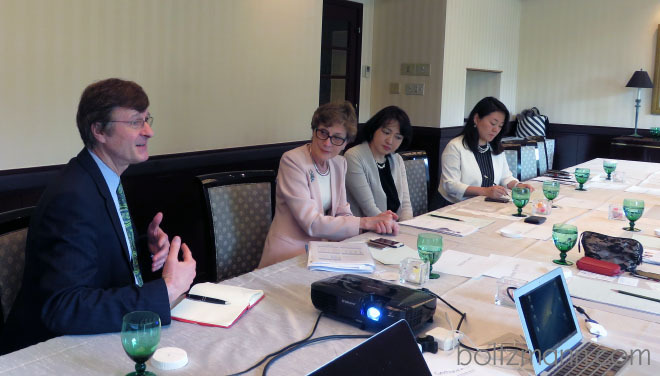 At a recent event of Trinity College Cambridge in Hong Kong, I met with Dame Carol Black, and our meeting led to today’s Forum. More about Trinity College Cambridge, for example on the website of our Trinity in Japan Society. Why Ludwig Boltzmann Forum? Who is Ludwig Boltzmann? I am developing the Ludwig Boltzmann Forum a global leadership platform in honor of my great-grandfather. 1872 Ludwig Boltzmann met Henriette von Aigentler (my great-grandmother), who was refused permission to unofficially audit lectures at Graz University, where Ludwig Boltzmann later became University President. Ludwig Boltzmann advised her to appeal, in 1874 Henriette passed the exam as high-school teacher, and on 17 July 1876, Ludwig Boltzmann and Henriette von Aigentler married. One of Ludwig Boltzmann’s students is Lise Meitner (November 1878 – 27 October 1968). She was only the second woman to be awarded a PhD in Physics from the University of Vienna. Later she was part of the team that discovered nuclear fission, Otto Hahn was awarded the Nobel Prize for this work. Element No. 109, Meitnerium, is named after Lise Meitner.